I thought of calling this post “Boulder Drop Never Used To Be This Way!” because that was JP’s outraged-sounding remark when, after a day of serious hole/multiple swimmer carnage on Boulder Drop at a medium to low flow he noticed that – adding injury to insult – the bow of Jon Griffin’s playboat was also massively caved in. It sounded kind of like the last straw and for some reason that remark cracked me up at the time. :) JP also figured prominently in the rescue, which I’ll get to shortly. Here’s my write-up of what happened in the hopes that it will help others stay out of a surprisingly vicious little spot that for some reason few people seem to know about. 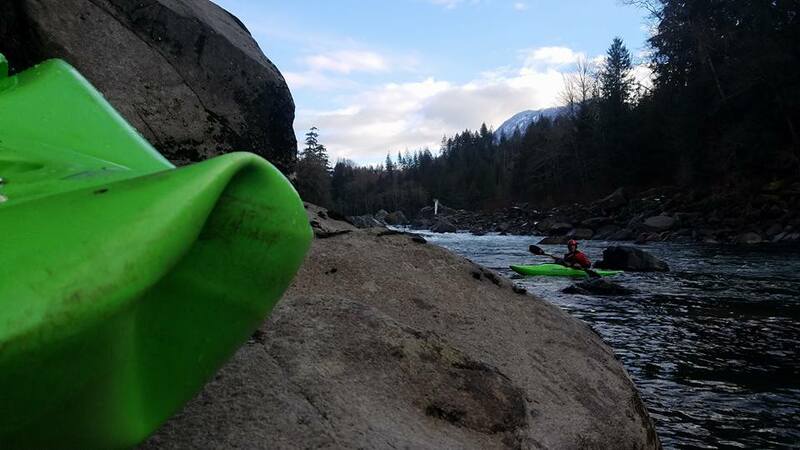 Basically, at medium/low flows on Boulder Drop rapid on the Skykomish River there is a keeper hole below the Picket Fence and off to the right, before the House Rocks section. (The Picket Fence includes Ned’s and The Needle.) You’ll only hit it if you don’t do the traditional center-left line that goes through House Rocks, and if you take Airplane Turn through the Picket Fence there’s probably virtually no chance you’d end up there. If instead after the Picket Fence you go off to the right above Big House (which is the right side boulder of House Rocks) so that Big House is ahead of you and kind of to your left, that’s where it is. Others have a better idea of the exact location than I do, here’s what JP wrote on Professor Paddle: “After the Picket Fence, if you peel off toward the right above Big House, there is a pour over. Its not the hole in the center above Big House. I’m talking about another hole River Right of that.” I should point out that it doesn’t even look like that much and if you charge it you’d probably easily get right over it – if you have a swimmer or someone is carping rolls through there or hits it sideways it’s more likely to be an issue. 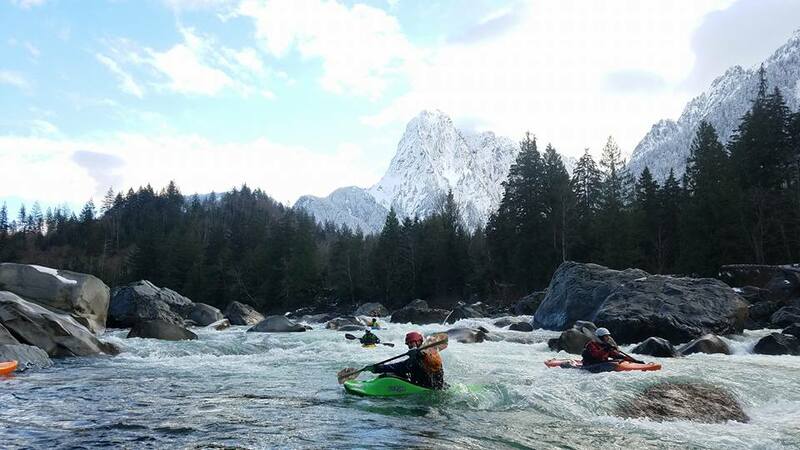 Anyway, ten of us were going through Boulder Drop on Christmas Day at around 1800 cfs, which I think because the gauge changed a year or so ago is equivalent to what maybe 2100 or 2200 cfs used to be on the gauge 3 or 4 years ago, in case you haven’t been out there in a while. I was in the tail end of the group when after the entry we heard there was a swimmer further down, so I peeled out and after Ned’s Needle decided to follow Rob seeing as he has tons of experience safety boating and I figured he had a bead on the swimmer and I could maybe help pick up the pieces. I never expected anyone to be actually stuck somewhere on Boulder Drop, I’ve never even heard of a swimmer being stuck there and it gets run (and swum) by first-time Boulder Droppers at this level frequently. And yet… Rob was around 20 feet in front of me as we were angling from center-right to right after the Picket Fence when he moved to the right and lo – I realized I was coming up on what looked to be a potentially crummy hole, with Jon in it staring up at me with that expression that says “I have been in here for far too long.” I wasn’t able to avoid the hole and was afraid to boof it hard and decapitate Jon, although in hindsight I would do things differently (see ‘lessons learned’ at the end). So I hit it with not much speed, got stuck and between the two of us thrashing around in there it was impossible to roll and I got pulled out of my boat. Jon got pushed out by the mayhem, which was fortunate for him because he said later he was on his last breath. I managed to keep hold of my paddle and boat and decided to hold on to my boat seeing as it’s got flotation in the stern and the bow, and I knew if this turned out to be a sticky hole I might need it. I also kept hold of my paddle, which was a mistake because in the course of getting windowshaded a few times the boat got ripped out of my hand and eventually left the hole. I got recirculated many, many times, and it was pretty horrible – not much air at all, and when I would surface I could see (sometimes from beneath a veil of water – did I mention this really sucked? :) Rob on river right and JP on river left of this hole, struggling to get to me but not able to. Kevin Hoffman was standing on river left on a rock trying to get a bag to me, but it’s really, really hard to bag someone from shore at this spot, not to mention always hard to bag someone who keeps getting submerged. Anyway, finally JP was able to get to me on the river left side with the bow of his boat and back-paddled me out, thank goodness. I’m not sure I was flushing at that point, I may have been but it’s not a sure thing and I would not count on seeing someone flush from there – I think you have to be prepared to boat-rescue them from the side, or by doing what Rob did years ago when Renee Paradis got stuck in there, when he came in from above and dropped in and grabbed her to drag her out. But she said on PP that she was getting air while stuck in there and I can tell you I was barely getting any, so it may have been a different level or might have changed. You definitely would want momentum to do that. 1) If I was coming up on a hole I couldn’t avoid and there was a swimmer in there I would do what Mike did on the Cooper this year and boof it with as much speed as possible and try to grab the swimmer on the way out – it worked for Mike that time. Either way I would hit it with speed and just try not to clobber the swimmer – getting stuck in the hole yourself is not helpful. Obviously it’s crucial to be ready to eddy out on the side of the hole in case you don’t get the swimmer out right away. 2) I would ditch the paddle and keep hold of the boat with both hands for flotation. Granted it might turn out that you get clobbered by the boat, but you can always decide to ditch it later, and it could turn out to be really helpful for flotation or for allowing someone on the edge of the hole to get a hold of it and pull you out. 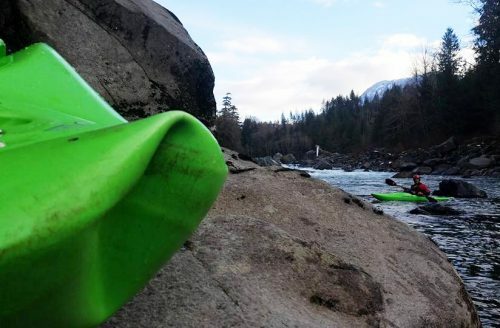 I’ve never heard of a paddle being helpful for getting out of a hole – not saying it doesn’t happen, but I wonder if the paddle actually kept me from going deep and possibly flushing out that way, so regardless that would be the first thing to go now. 4) Never take anything in whitewater for granted. This is our backyard run and I find it amazing that a hole this dangerous is in there at low to moderate flows and very few people know about it. I’ve run Boulder Drop probably 200+ times and have never heard of anyone getting stuck in there, except for Renee back in 2007 and as I mentioned I didn’t even realize that was in Boulder Drop. And finally this was a good reminder to be thankful for friends. Just knowing two really competent boaters like Rob and JP were trying to get to me was a comfort, JP did a fabulous job on the rescue, once I was out on shore Kevin Hoffman was working on warming up my hands before I even realized they were numb, and Susan and Andy went looking for my paddle and found it on the right side of the Weir, which I was super happy about. Photo looking back at Cable Drop rapid, by Nick Baughman. Believe it or not we had a great rest of the run and it was an amazingly gorgeous day! Apparently very few people end up in this hole and I’m not trying to scare off newer boaters who want to run Boulder Drop, but I am saying this is definitely a spot to know about and avoid in maybe the 1500 to 2100 cfs range (I’m guesstimating), and if there’s someone coming behind you who you think might hit it swimming, rolling, or sideways, definitely eddy out and be prepared to rescue from mid-stream. So glad you’re OK! I don’t remember that hole either. I’ve probably run BD about half the times you have and that’s still a lot. Can’t think of better people to have covering your back than Rob, JP, Mike, Kevin, et al. A stellar crew. Cheers! Thanks Kyle! I agree, it was a stellar crew, better to run into a spot like that when people like that are around than some other time!